Do you shy away from computers? Are the keys on the keyboard too small; the letters on the screen impossible to see; the internet too confusing? Are you afraid that you’ll just mess everything up so you decide to stay away? Or, maybe you are okay with the computer, but the popularity of endless social media platforms keeps you light years behind today’s younger generation. Well, with just a few quick lessons, you too can develop a knack for technology and watch how your life changes for the better. Learning to use social media platforms like Facebook isn’t as challenging as you might think, and you might be surprised about all of the ways your life can be changed for the better, all because of a little technology. 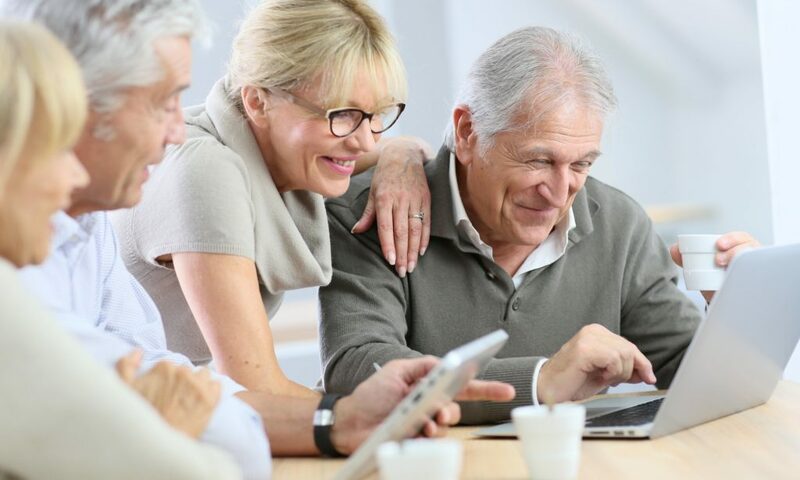 Here are six reasons why technology can improve the health and happiness of seniors. In today’s busier-than-ever society, the closeness that extended families once felt has suffered greatly due to a number of factors. Jobs often force adult children to move away from their parents. Busy sports or activity schedules for grandchildren often mean that visits to grandma and grandpa’s house get put on hold. No matter the reason, it seems like there is never enough time to spend with those we love most. Social media is a beautiful tool to solve that problem. Through Apps like Facebook, Instagram, Messenger, and Twitter. or smart phone apps like FaceTime or Marco Polo, you can stay connected to those you love in an instant. You can watch live video of your granddaughter’s ballet recital or your grandson’s first homerun. You can see all the pictures from your son’s trip to Europe, or you can share pictures with your own family about all of the exciting places you’ve traveled to. The point is, social media opens up a world of opportunities to stay connected to those you love, even when time and distance prohibit you from being together. Do you keep in touch with your classmates from high school? Do you still get together for reunions, 50 years after graduation? Does that college roommate live across the country now? Social media provides you with the opportunity to keep in touch with those friends who were near and dear to you in years past. We all need friends, even as we get older. Social media tools are a great way to stay connected with long lost friends who meant so much to us in years past. Remembering the good ole’ days will bring a smile to your face and help your mental health along the way. One fact that is generally agreed upon in the medical community is that social interaction for the elderly helps to improve physical, emotional, and mental health. A healthy social life can reduce the risk of Alzheimer’s Disease and many heart conditions. Interactions with others can improve our emotional health and reduce the risk of developing depression. The use of social media tools can be a great way being a healthier, happier YOU! Social media platforms, like Facebook for example, can connect you with new friends and groups in your area and can widen your social circle. Discover others with similar hobbies. Find out when groups in your area meet and then go join them. Making new friends can be a challenge for grade school students AND for Seniors, and everyone in between. Social media tools provide a safe and easy way for you to discover which groups exist in your area, and how you might get involved. The thrill of making new friends is one important step to improving your health. Community involvement is a great way to stay connected to what’s happening in your neighborhood, give you a sense of purpose and contribution for every day, and help you live a healthier, longer life. A simple search on Google or exploring the groups on many social media platforms can help you discover volunteer opportunities in your neighborhood that fit your schedule, physical abilities, and interests. Is there a neighborhood food pantry that you can volunteer at? Does the elementary school need volunteers to help students with reading? Is your local hospital or library looking for volunteers? Is there a community garden that you can help maintain? No matter your interest, there are service opportunities waiting for you to discover. Technology is the key to finding the right place for you to be. Social Media Offers a Sense of Connection and Engagement to Younger Generations. When we look around, it can be easy to feel so far separated from today’s youth. The clothes are strange; the music is loud; and the way they talk is like nothing we’ve ever heard. Unless you’re like Betty White, you probably feel a bit disconnected from this younger generation. Getting a social media account can help you keep up with what’s happening in the ever-changing world around you. Find out what’s happening with the latest celebrity gossip; stay up to date on political happenings; or, discover which here-and-now musician is remaking one of your favorite songs from 40 years ago. The next time you chat with your teenage granddaughter, show her that you’re a little more slamming than she ever thought. Technology does not have to be the enemy for seniors. It can open up the door to improved health, better relationships with family and friends, and connections to your community. Taking advantage of all of the benefits of technology in your life can lead you on a path to a happier, healthier you. At Canadian Safe Step Tubs, we also care about you discovering your happiest, healthiest you possible. Our elegant (and highly functional) walk-in tubs provide you with rest, relaxation, and added independence in your golden years. Call today to discover how a new tub from Canadian Safe Step Tubs can change your life.